Carleton University Business co-op students nominate Gazaro for rich work environment. Gazaro is very pleased that our Carlton co-op students learned a lot from their time with us, as they have played a significant role in the growth of our company. 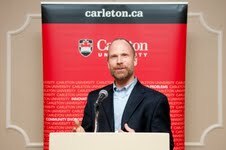 Alexander Rink, CEO of the start-up company Gazaro, was named one of Carleton University’s Co-op Employers of the Year and was presented with an award at a ceremony. Carleton University Business co-op students Tania Steyn and Sam Storry shared why they nominated Rink. Carleton University offers co-operative education opportunities in more than 140 academic programs, streams and concentrations at the undergraduate level and in six programs at the master’s level. Carleton’s co-op program is diverse and flexible. Students who choose co-op alternate periods of study of four, eight, 12 or 16-month work terms. Co-op is a paid and full-time working opportunity for students and provides numerous benefits to participating employers. For more information, visit http://www1.carleton.ca/cc/employer-services/. Gazaro is a leading provider of Price Intelligence solutions that give retailers complete market, competitive, channel and pricing visibility to successfully calculate their path for profit. For more information, visit Gazaro.